So when it comes time for St Patrick's day, we always seem to be in a panic trying to find green clothes to wear. Sometimes, we find the littlest thing to keep ourselves Pinch Proof, but this year, I'm ahead of the game. I'm making each one of the kids a St Patrick's Day Leprechaun angel to wear. And they are super easy, so you can Pinch Proof your kids pretty simply too! I started with a quick trip to Walmart. You can probably make these much cheaper if you have a good craft store around, but I only have Walmart, so you go with what you got. I bought a Bucket of Bling, some Faceted Beads, a few Silver Butterfly clips (from the Office Supply area), and some bar pins. Start by stretching your butterfly clips arms out. Add 2 of the faceted beads to each side. Bend the arms back in and close to the body to hold the beads in place. Using E6000 glue, place a little glue on the back of one of the circle diamond pieces from your Bucket of Bling. (You can buy these separately if you have a good craft store that sells them) or you can put the glue on the edges of the "shoulders" of your butterfly clip. 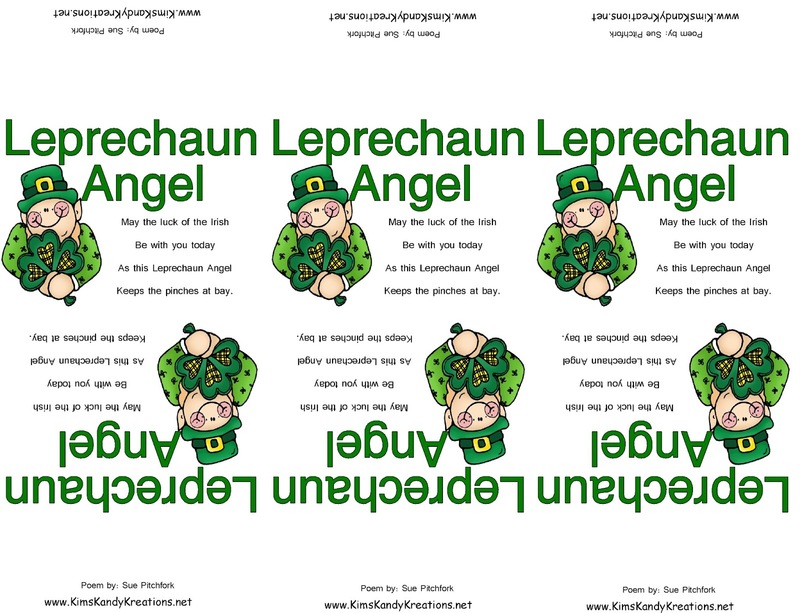 Using a green heart, or a shamrock button, or other lucky embellishment, glue to the center of the angle--right around where the arms meet. Flip the angel VERY CAREFULLY over to the back. Place a long strip of E6000 glue along the edge of the bar pin and place behind your diamond "head". Allow glue to dry. Keeps the pinches at bay. Just add the angel to a 3x4 bag from Walmart or other craft store and staple this topper on top. Now you have a fun and unique gift to keep the Leprechauns from pinching you all day!